I’ve always wanted to be a chrysanthemum, rather a daffodil. 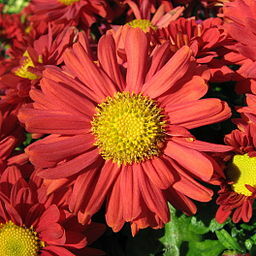 Chrysanthemums bloom late. When I was twenty-three, one of my colleagues announced she was getting re-married. She was thirty-three. Some of you may smile benignly and say, “What is she talking about? Seventy-one is not old. She’s a kid…I have bunions older than her.” Bless you. I want to age well, and I don’t have much time to figure out how. I’ve begun to go to the gym more, walk in the park more, use my brain occasionally. I hope it helps though I realize it takes a certain amount of dumb luck to stay healthy to a ripe old age. Accidents and disease happen. I think about the ladies in the Alzheimer ward to whom a storytelling friend and I tell stories twice a month. Those ladies never planned to spend their last days in a nursing home, eating orange Jell-o, listening to our stories—and forgetting them. As it happens, thanks to storytelling and a lifelong learning group I belong to, I also have friends and acquaintances more or less ninety years old who are able to be active and engaged in life. Recently I went to the ninetieth birthday party of a friend of mine from a writing workshop. She writes beautiful prose about her childhood home. She paints and writes poetry too. She is charming, gracious, and warm. She smiled broadly when she told her guests that she never thought she’d be lucky enough to reach ninety. Nice attitude, don’t you think? Another friend also celebrated her ninetieth birthday in the past year, a fellow storyteller. The summer after her birthday, she and her family visited Yosemite–a long trip from NY state. She tells wonderful stories that are usually funny and always ring true—of her girlish crush on a baseball player living next door, of a walk across a frozen Niagara Falls, of boys who got trapped in a water tower on a hot day, of a loathsome lady who knew the answer to the riddle asked of King Arthur, “what is it that women want?” She is open-hearted, encouraging, frank, and humorous. One woman is leading weekly walks this spring in the state park near my home. I remember a hike she led a few years ago. Her passion for the environment and her knowledge of the plants we saw are stunning. A former art teacher is leading a drawing class for seniors. She’s taught these popular classes every semester since she retired, twenty years ago. Remarkable women, all of them. They have surely endured their share of hardships and loss and will endure more. But they choose to embrace life and look forward to the possibilities still open to them. They read, take classes, pursue their hobbies, laugh, meet with friends old and new, and care about the other people in their lives. I don’t mean to gloss over the challenges of old age—or maybe I do. Friends of mine are dying or dealing with serious health problems and I become afraid. But I remember my friends who are ninety—or almost ninety—or over ninety. I need them and other people like them in my life to inspire me, give me hope, and get me off the couch. When I grow up, I want to be just like them.